HOUSTON – About 1,500 janitors, labor activists and supporters gathered for a “contract convention” on Oct. 10 here. The meeting was exuberant with a number of rousing speeches in Spanish and English. Following the meeting was a spirited march to the Williams Tower office building, about two miles away. 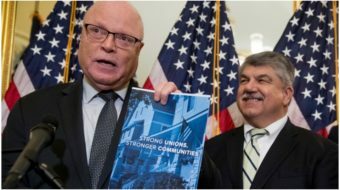 There was a great show of union solidarity with members of the American Federation of Teachers, AFSCME, United Auto Workers, International Brotherhood of Electrical Workers, Houston Organization of Public Employees, as well as, the Harris County AFL-CIO all present. Service Employees International Union activists from Chicago were also present and provided a great deal of support. 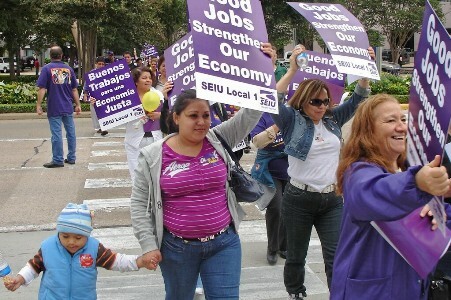 SEIU represents 3,200 janitors in Houston. The contracts are due to expire on Nov. 20 and the union is seeking to reopen negotiations. Richard Shaw, secretary-treasurer of the Harris County AFL-CIO, addressed the crowd, “I want to congratulate you, you got a union, you got a contract, got some health care. The janitors have been subjected to oppression in their organizing drives in New Orleans and Houston. Police have used horses to intimidate marchers in both cities, injuring janitors. Other dignitaries present included Houston City Councilwoman Jolanda Jones and mayoral candidate Annise Parker. There was a video message of support from Rep. Al Green, D-Texas. SEIU led a month long strike in Houston three years ago over the right to form a union and to engage in collective bargaining. Labor agreements were reached with office buildings that house some of the richest corporations in the world. Prior to the contract reached three years ago, Houston janitors made about $20 per day and had no benefits for health care or retirement. They are now making $7.75 per hour. Janitors today are demanding increased wages and benefits so that workers can have a better life and contribute fully to the local economy. When workers are forced to live in abject poverty they are less able to contribute to the local economy. This severely weakens the Houston economy, local labor activists say. Many other organizations were there to provide support and express solidarity to include CRECEN, America Para Todos, and LULAC. In all there were 70 organizations supporting the effort.